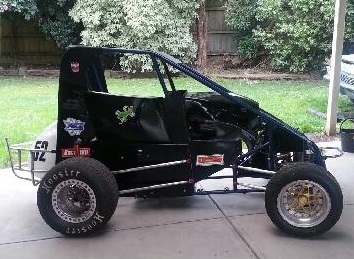 The Victorian Compact Speedcar Club’s Committee made the decision recently to build up a Club Car. The idea behind it is to use it for ‘come and try’ days for potential members as well as putting it on public display at various locations including tracks and at sponsors premises. So, to keep you all updated on the progress, we will be providing updates on where the car is at as members of our club work together to bring the club car to life. Our first photo is of the actual car. The club purchased Herb Hecker’s rolling chassis and this week it is off to the sandblaster and powder coaters. Stay tuned for more updates and pictures!